"He didn't talk to me. Obviously." 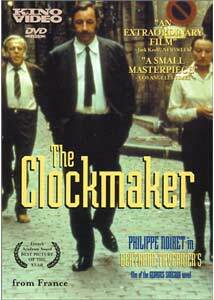 Michel DesCombes (Philippe Noiret) is The Clockmaker (L'Horloger de Saint-Paul), a middle-aged man who finds himself in the middle of a police investigation and its attendant media circus after his son Bernard (Sylvain Rougerie) is accused of murder. Leftist politics, strong-arm threats, deceitful journalistic tactics, and an unlikely friendship with Police Inspector Guilboud (Jean Rochefort) complicate Michel's life and his reaction to the situation. But as he struggles with his emotions, Monsieur DesCombes begins to recognize his younger self in his estranged son; the two are drawn closer together even as Bernard faces up to twenty years in prison. Star Philippe Noiret contributes another strong performance to the New Wave cinema, and he does it in such a transparent way that he scarcely seems to be acting. Noiret's Michel makes his decisions privately, but the thought process is very visible onscreen—whenever he so much as brushes a hand across his forehead, we know exactly what he's feeling. His performance is a critical element of the film—we never even meet many of the characters who are mentioned or glimpsed in photographs, and the story is carried on Noiret's shoulders. Jean Rochefort also contributes an effective, credible performance as Inspector Guilboud, a bureaucratic but human official who sympathizes with Michel even as he tracks Bernard down. There's a political subtext to the film—Bernard's alleged victim is a hated factory supervisor, an authoritarian lecher who uses his power to harass the working girls and fight the union, and we learn that Michel himself has a history of resisting abusive authority. But The Clockmaker is not a political film—the political discussions and opinions voiced by its characters lend texture and realism to the story, but have little to do with its intended message. It is a portrait of one man's relationship with his son, and the potential for redemption in time of crisis. It's intimate, touching and thoroughly credible. Recommended. Image Transfer Review: Kino presents The Clockmaker in its original 1.66:1 widescreen theatrical aspect ratio, with a nonanamorphic transfer apparently drawn from an analog video master. Reds are blurry during the opening credits, shadow detail is murky, and the picture suffers from middling detail in many scenes, along with occasional damage, frame instabilities and reel-change markers inherited from the source print. There's some visible edge enhancement, and the DVD image has a slightly dated "laserdisc" look overall. It's not a terrible transfer—most scenes look clean, colors are muted but natural, and the defects aren't seriously distracting—but it's not completely up to DVD standards. Audio Transfer Review: The Clockmaker is presented in Dolby Digital 2.0 mono format, designed for ProLogic decoding to the center channel. It's an impressive audio presentation, given its vintage and monaural nature—dialogue is clear, frequency range is competent (with some natural-sounding low-end bass) and ambient sound effects are mixed in with subtlety and care. Much of the dialogue was recorded "live" and carries a certain amount of background noise, but the effect is rarely distracting and generally enhances the film's verité character. A clean, solid audio mix, much better than one might expect. Extras Review: The Clockmaker clocks in with almost no supplemental support, just 14 picture-menu chapter stops. The player-generated English subtitles cannot be turned off, which may be an issue for French-speaking viewers. The Clockmaker is a strikingly intimate portrayal of a father's belated recognition of himself in his son. Kino's DVD transfer isn't top-notch, but it's serviceable, and the film is a fine example of the French New Wave movement. Well worth a spin.